Waneta Strackbein Strickert, 91, of Nashville, passed away on November 9, 2018. 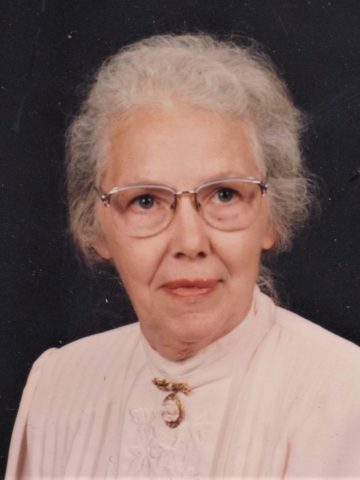 Waneta was born November 25, 1926 in the community of Midway near Correctionville, Iowa, to Thomas Henry Strackbein and Erna Brodersen Strackbein. Growing up on her parents’ farm, her inquisitive spirit and love of nature blossomed. After graduating from Correctionville High School, she taught in a one room school house in Iowa during World War II. She put herself through college, attending Valparaiso University and the University of Iowa, where she earned B.A. and M.A. degrees in sociology. While at the University of Iowa, Waneta met Roland R. Strickert at the campus Lutheran church. They married on June 6, 1952, the same day they both earned their graduate degrees. They moved to Nashville, where they lived the rest of their lives. Waneta was deeply involved in her church. She was a charter member of Our Savior Lutheran Church. She served as church organist, taught Sunday School and Adult Bible Class, and served on the boards of education, evangelism and stewardship. Additionally, she served in Lutheran Hour Ministries at her congregation and in the Tennessee District, and served on the LCMS Mid-South District Board of Stewardship. Waneta designed the Prayer Garden at Our Savior and led the congregation’s Stewards of the Earth group, which maintains the gardens on church property. She loved to arrange flowers and brought weekly arrangements to church year-round from her garden. Waneta was an avid gardener and renowned expert on herbs. For years, she opened her Cameo Gardens for spring tours. She designed herb gardens in Nashville’s Centennial Park and at the James K. Polk Home in Columbia, TN; and restored the 1798 herb garden at historic Cragfont. She was a member of the Herb Society of America and the Herb Society of Nashville, serving on the Board of Directors for each. Waneta was a Master Gardener, serving in various executive positions for the Master Gardeners of Davidson County. She taught Master Gardeners classes and wrote about herbs for their publications. Waneta was also a guest lecturer on herbs both locally and nationally, and received numerous awards from the Herb Society and Master Gardener organizations. Waneta was involved in Girl Scouting, serving as troop leader and later as President of the Cumberland Valley Girl Scout Council. She also served on the boards for Birthright of Nashville, for the Nashville Symphony Guild, and the American Guild of Organists, Nashville Chapter. Waneta was preceded in death by her parents, Thomas and Erna Strackbein; her husband, Roland Strickert; her son, Andrew Strickert; her grandson, David Forde; and her brother, Lee Strackbein. She is survived by daughters Claudia (Michael) Forde, Sarah (Carney) Baker, and Emily (Jeff) Agee; daughter-in-law Janice Morris; grandchildren Tom Strickert, Stacy Sims, Rebecca Jackson, Andrew Strickert, Jr., Mitchell Baker, Amanda Strickert, Gregory Baker, Leigh Ann Madison, Brian Baker, Eric Forde, and Peter Forde, and fifteen great-grandchildren. Visitation will be Sunday afternoon from 4:00 to 6:00 p.m. at Our Savior Lutheran Church, 5110 Franklin Pike, Nashville, and again on Monday morning at 10:00 a.m. at Our Savior. Services will follow at Our Savior Lutheran on Monday morning at 11:00 a.m., with burial afterwards at Harpeth Hills Memory Gardens, 9090 Highway 100, Nashville. In lieu of flowers, memorial gifts may be made to Lutheran Hour Ministries. Our thoughts and prayers go out to the family. May God bless her forever. Waneta; We celebrate your rich life and the blessings that you gave to your family and friends! We look forward to seeing you in our heavenly home;when all our griefs and cares are gone! God’s blessings to your family! Our prayers are with them! Love, in our Lord Jesus’name! Your nephew, Rick, wife, Jane, and daughters Amy & Katy & family!